CALIFORNIA: Assemblyman Evan Low Proposes Ban On State-Funded Travel To States With Anti-LGBT Laws - Joe.My.God. A gay California lawmaker wants to ban state-funded travel to states with anti-LGBT laws. 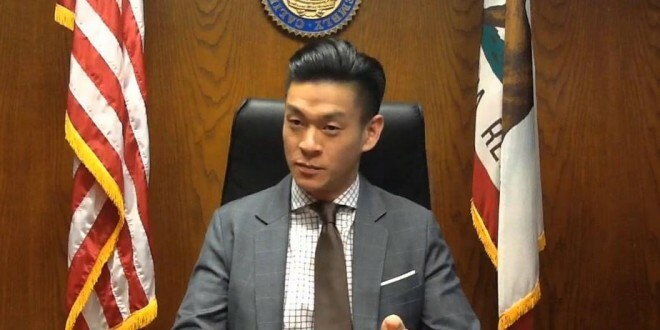 Assemblyman Evan Low (D-Campbell) has introduced AB 1887, which would end state-funded travel to any state with a law in effect that sanctions or requires discrimination on the basis of sexual orientation, gender identity, or gender expression. The announcement by Low’s office this morning (Wednesday, February 17) comes as a number of Republican-controlled state legislatures in the Midwest and the South have moved to adopt a range of anti-LGBT legislation. While measures in Indiana, Washington, and Virginia have been defeated in recent weeks, several pieces of legislation that discriminate against transgender students have been advancing in South Dakota. And a bill in Tennessee giving counselors the right to not see patients based on their religious beliefs is now before that state’s Senate. The American Civil Liberties Union and LGBT rights groups are also tracking anti-LGBT bills in the state legislatures in Georgia, Florida, West Virginia and elsewhere. RELATED: Low, now 32, became mayor of Campbell, California (population 40,000) in 2009 at the age of 26, making him the youngest openly gay Asian-American mayor in US history.